I was totally unprepared to take my younger daughter back to college this year. She was asked, last minute, to return to school 2 weeks earlier than planned to assume a leadership role on campus vacated by another student. I am now scrambling around, trying to find all the sheets and towels, books and posters which we squirreled away in our basement with the expiration date of 28 August. Although we had no specific plans for the next two weeks, we did have those two weeks, and now, quite literally, they have disappeared. I am flummoxed. I am disorganized. I am sad. But most of all, I am rushed. Last year I wrote a piece for this blog called A Case of September Sadness. It spoke to all the moms, first year college and returning, about the void their college student leaves in their lives when they move back into their dorms, apartments, fraternity or sorority houses, learning communities etc. I spoke about the neatly made beds and carefully organized closets left behind on move in day by Moms and Dads who see the college student through first grade glasses… all rosy cheeked and pigtailed, headed to the bus stop with her hello kitty backpack. It spoke about the unavoidable void in the hearts of college moms everywhere. This year, I have no time for the void. I have two weeks’ worth of prepping to do in 18 hours. There are things to find, cars to load, insurance cards to copy. I have no time for melancholy if I want her dorm room to look like the lovely, yet unreasonable, Pinterest pins and Facebook posts I have seen this year. It could be dorm decorating challenge or tragedy, depending on the outcome. (And I am a seasoned dorm decorating mom : 8 years of prep school move ins, plus 7 years of college move ins, gives me mad move-in cred.) 18 hours to accomplish what it took me 18 years to imagine: color coordinated shower caddy and bedding. Meaningful posters and cheery pictures of homes we have lived in all over the world. An inspiring study area (we used to call the desks) and a tranquil resting area (bed.) I am now no longer worried about everything being the same shade of pink and yellow; I am more worried about everything just being clean. I can’t even begin to think about her being away, I am just trying to check a few things off my checklist. One of my oldest friends just left her first child at a school about 1000 miles away from their home. As she drove back to the hotel, the local radio station played “Cats in the Cradle” by Harry Chapin. Four boxes of Kleenex later, she was fine. In her mind, she knows that her community-oriented, gregarious, fun-loving, kind son will do beautifully in his new environment. She has had all summer to prepare for his departure and new life on campus, but these final days have been tough for her- she, like so many others, is a bit heartbroken. I have no time for heartbreak. I am too busy flipping the laundry that was in the “I have two weeks to get to it” pile. But as I race around getting things done, it dawns on me, that I only have one more of these left. One more rush to dry clean sweaters than mysteriously lived under a bed for the summer, one more night of hoping that the car fits everything. One more August full of infinite possibilities for one of the two young women whom I love most in this world. One more lonely drive home from campus, while although, in my case is close by, seems like it is an insurmountable distance from our home. These drop offs are teaching me to let go. To let go of the things of which I have no control-of things which they should know by now- of things which I can no longer influence except through our history. I am learning to trust their instincts, their kind and generous hearts, their passions, their sense of right and wrong. I am learning to think of them as independent. With every early fall dorm move in day, they are becoming decision makers, evaluators of people and thoughts, adults. Dr. Ken Ginsburg writes in his book Letting Go with Love and Confidence that “one of the hardest parts of letting go is slowly leaving behind the fantasy that you can protect your child from the world…. Our challenge is to prepare our teens to navigate the world- with all of its joys and knocks- on their own. “ This drop off is a litmus test for which we have been preparing our kids for the last 18 years. Each year, the drop offs get faster and the good bye get quicker, and they walk away more and more confident. College is the time for dreams to become concrete plans, for pathways to goals to ferment and foment into achievements. College is the final exam after 18 years of parenting. Will they make bad decisions? Yes. Will they figure out how to fix them? Yes. Will it take every ounce of your being not to ‘help?’ yes. Are they capable of letting go? Of course. This path is theirs to walk. I didn’t have time to get melancholy this year. I didn’t have time to be sad. I had just enough time to get her moved in and give her a hug, and she was off. But most importantly, I didn’t have the NEED to be sad. I let go of what I am missing in favor of grabbing onto the joy of who she is becoming. 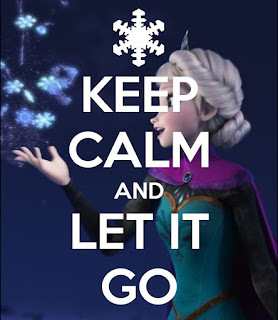 Sadness: Let it go. They have gotten to this place due to the building blocks you gave them: responsibility, vision, morals, values, kindness, open-mindedness, trust, imagination, heart. Grab onto the joy that is coming as they become successful, happy, responsible, caring adults.